I am still loving the whole 30! 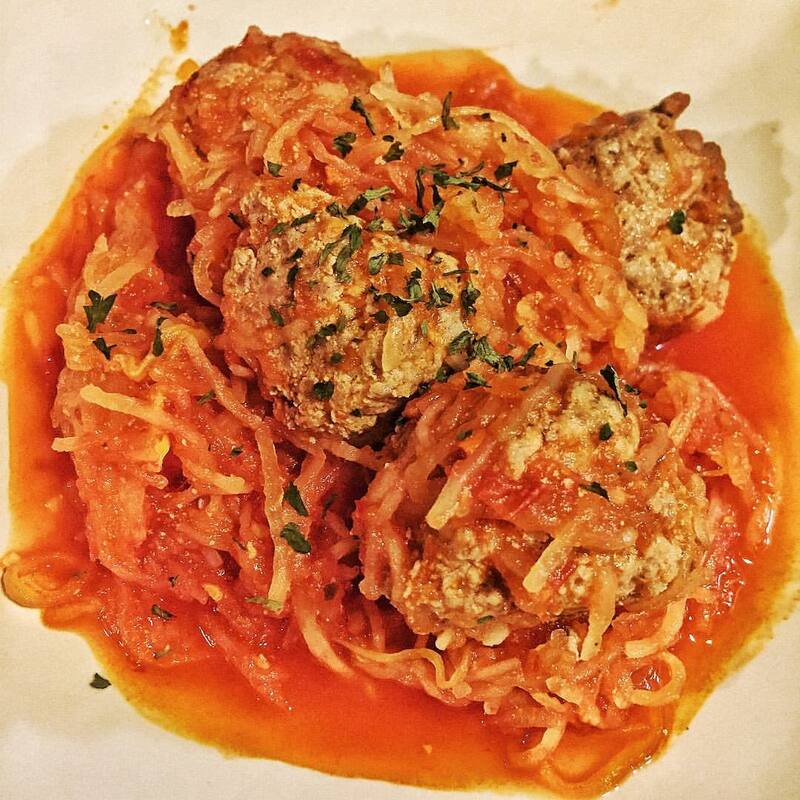 I am Sicilian and grew up on spaghetti and meatballs so it not only brings me back, it is something I crave. This Whole 30 approved recipe that I got from the Whole 30 cookbook and made a couple tweaks on was just what I needed last night for dinner! PREHEAT the oven to 425 F. Line a baking sheet with foil or parchment paper. CUT the squash in half lengthwise and remove the seeds with a large spoon. Drizzle the insides evenly with the olive oil. Place the squash flesh-side down on the baking sheet. ROAST the squash for 1 hour, until fork-tender. Carefully turn the squash flash-side up and let cool until cool enough to handle. USE a fork to gently scrape out the flesh; the squash will come out in a noodle-like strands. Season evenly with the thyme, salt, and pepper, and serve immediately. THOROUGHLY mix the turkey, egg, onion, garlic, oregano, salt, and pepper in a large bowl. Roll into 15 to 20 meatballs, each about the size of a golf ball. MELT the cooking fat in a large skillet over medium-high heat. When the fat is hot, add the meatballs. Cook for about 30 seconds per side, turning to prevent burning, until browned all over, about 5 minutes. Reduce the heat and add more cooking fat if the pan begins to smoke. TRANSFER the meatballs to the prepared baking sheet. Transfer to the oven to finish cooking for 8 to 10 minutes, until the internal temp. reaches 160 F. Let the meatballs rest for 5 minutes and serve.